This site is dedicated to all of us Retirees who seek an affordable and healthy way to escape the northern winters and enjoy life to its fullest. The focus of the site is on the life in the many retirement Resort Parks located in the southern U.S. States. We have begun with a concentration on the state of Arizona and specifically the Phoenix East Valley area, (Mesa, Apache Junction etc), Yuma, Tucson, and points in between. In an attempt to bring people together with the information they seek, you will find several links out to snowbirdtrailer.com. There you will find information focused on park models and other units, parks, and rental and sales listings. USA Today recently used arizonasnowbirdparks.com as a resource (and link) in a travel article about places to spend time in Arizona. We are glad that this lifestyle is receiving more recognition and of course proud that our work over the past 8 years is helping. Already have visited and maybe spent some time in a park and now want to find a property in a resort community to rent or buy. Owners who want to find information on upkeep, repair, and renovation. Those with a property, park model, 5th wheel or rv for rent or sale in a park. FORTUNA DE ORO in YUMA has the distinction of being one of the few parks with its own golf course. The facilities are top notch and they have tons of activities to meet the needs of all residents. RINCON COUNTRY TUCSON is an award winning park. Includes two parks ... Rincon Country East and Rincon Country West. The parks have been rated in the top 1% of all RV parks in the U.S and have received numerous awards by various park rating organizations. DESERT SHADOWS in NORTH PHOENIX near SCOTTSDALE ... Perfect 10/10/10 Star Rating by Trailerlife, Woodalls & Good Sam. The park is located in close proximity to Scottsdale as well as the NW communities of Peoria, etc. AGAVE VILLAGE RESORT in MESA ... Nice park with major renovation taking place. Offer a variety of used and new unit special. GOOD LIFE in MESA (East Valley)... is a top notch park with extensive ammenities. Go to their website and view the video of their activities and ammenities. It also gives special attention to pet lovers with facilities designed for those loved ones. VAL VISTA in MESA (East Valley) ... a large park with its three unique 'villages' within one resort. It boasts dozens of ammenities and activities including dinner theatres and other entertainment. Check out the video on thier website. SUNDANCE in YUMA is a top rated park that provides a wide range if facilities and activities including popular sports facilities and regular live music. ARIZONA LEGENDS in BENSON is a fairly new concept park which is privately operated but you own your lot and pay a modest annual fee for central services. Appeals to those wanting to get away from the cities. Check out some of the parks websites on the Park Chart and pay special attention to their facilities and activities. It will help you get a sense of what it is like. If you are looking for a park model to rent or buy make sure you are familiar with all the park model and RV park options. Check out some of the ad listings in the Park Models for Sale or Rent section. Unfortunately there are no recent studies done on this sector. The latest study done by the Arizona State University (ASU) on the snowbird market determined that (in 2003) there were 300,000 snowbirds who become semi-permanent residents in Arizona over the winter months. This figure does not include the more casual short-term winter vacationers who stay in hotels or travel through in RVs, 5th wheels or other means. In 2003 there were 160,000 snowbirds living in about 80,000 park model units. A large percentage are in the Phoenix AZ area. The highest concentration being the Phoenix East Valley region which includes the cities of Mesa and Apache Junction. This area has about 33,000 unit spaces, mostly located in the many RV resort parks. There are also a few thousand in Tucson and Yuma ... also very popular with snowbirds. One (unexpected) challenge in developing this site was what to call it and how to describe our focus on park model living in Arizona resort parks. It is difficult to know what to call either the parks or the trailers. (Or even the residents) Some refer to the parks as Retirement Trailer Parks, or Seniors Parks, or Snowbird Mobile Home Parks or 55+ Trailer Parks. 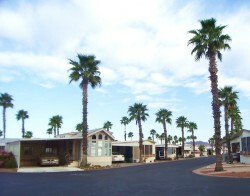 The formal name used by most of the parks is RV Resort Parks. But that does cause some confusion.